Click on the questions so they will expand for the answer. In order to assure the right dimensions and output of your print project, we ask that you submit your files in the following formats at 300 dpi minimum in the following acceptable format. 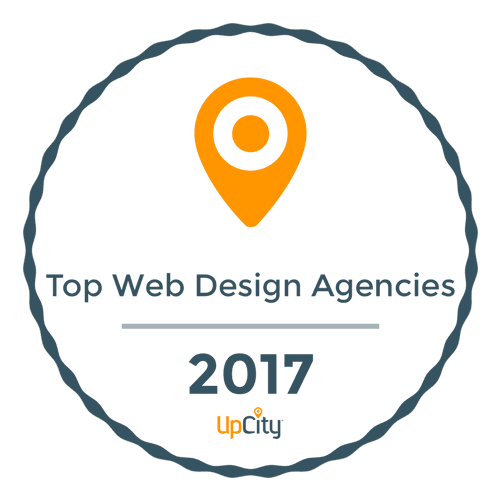 (PSD, JPG, AI, PDF, EPS, INDD). Many things can cause banding. Banding can be caused by the program that is exported from. Also, too many gradient steps, for example going from a very light color to a dark color, in a small area will cause banding. To prevent this, check your digital files before sending. 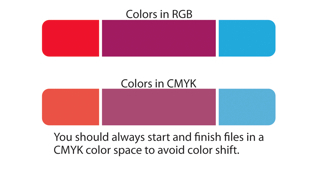 If you use a gradient, make shure it has enough room for a smooth transition. 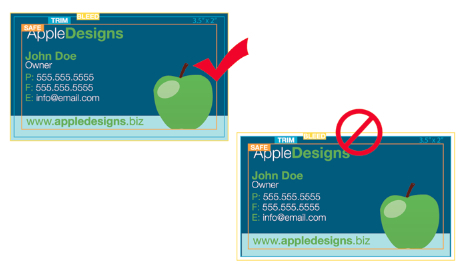 All files must include a 1/8″ (0.125 inch) bleed per added to the finish size regardless if your artwork does not bleed. 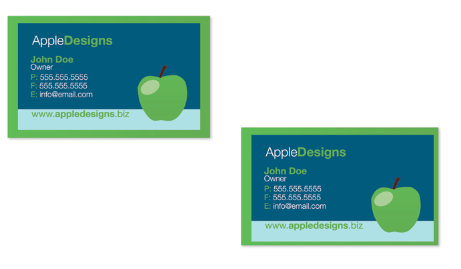 Example of bleed setup for a business cards sized at 3.5 x 2, the canvas size should be 3.625” x 2.125”. It is recommended for catalog file to be submitted in multipage pdf’s. Our automated imposition software will do the rest. 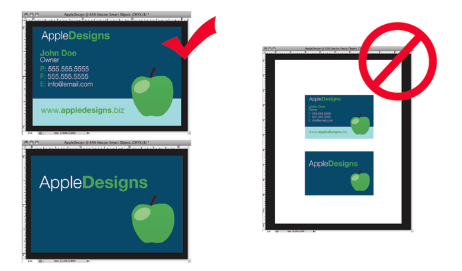 All type (fonts) must be converted to outlines if you are sending us an Illustrator file or a pdf. There is no need to outline fonts if you are sending a jpg. 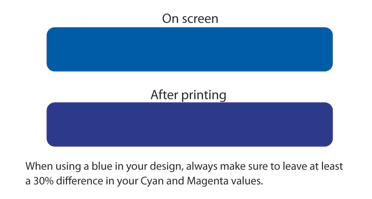 All scans should be converted to CMYK and be a minimum of 300 dpi. 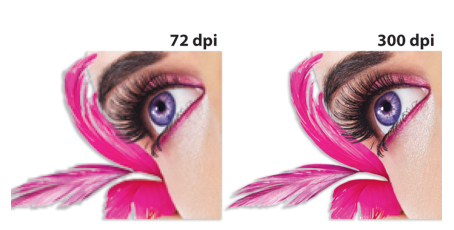 We accept AI and EPS files (with fonts outlined and pictures embedded), jpg, pdf, tiff, psd files. We are not able to accept InDesign files due to the restriction on opening from other versions (please convert to jpg or pdf). We cannot accept any Microsoft formats just as Word and Publisher (they will need to be converted to jpg or pdf). Yes, all information we collect is for order processing only. Your information is only used to contact you when necessary and we do not store your payment information ever. Credit Card information is only used to bill you for products and services ordered. Once an order has been placed, it is difficult to change. Shipping changes are time consuming and costly for us. In the event that you need to change any shipping information (shipping service, destination address, etc.) after you have placed your order you will be charged an additional $50. UPS Ground shipping takes from average of 3 business days depending on your distance from our production facilities in Southern California, Texas and Miami Florida. Other shipping options include: 3 Day Select 2 Day Air Next Day Air Saver Next Day Air. Chile Media, LLC will normally deliver the exact quantity of goods ordered plus a small additional amount. There is no extra charge for the additional amount. This extra amount is normally to compensate for the industry standard variable consistency in cuts or colors. The generally accepted trade practice is plus or minus 10%.